Sorry about the title. I really tried to come up with something more politically correct, but I just couldn’t. So ridiculous was the ruling of the Swedish highest court (Högsta Förvalt­nings­doms­tolen) last Friday. If you speak the language, take a look, it is pretty short reading. And it is really, really scary. Basically it states that a drone (UAS) with a camera is regarded as a surveil­lance tool and it’s use for any purposes forbidden by the law. The argumen­tation goes: “… it could be used for surveil­lance ( perso­na­lö­ver­vakning)( …)and it is also required that it is not operated in the place it is set up”. Let’s just look at the practical side of this. In Sweden it will be illegal to shoot these images with a “drönare” as the press­le­sease from the Swedish court states. Profes­sionals btw refer to them as UAS/RPAS — we do not like to talk about “drones/drönare” for obvious reasons. Notice, it is not taking a picture which is the problem here. 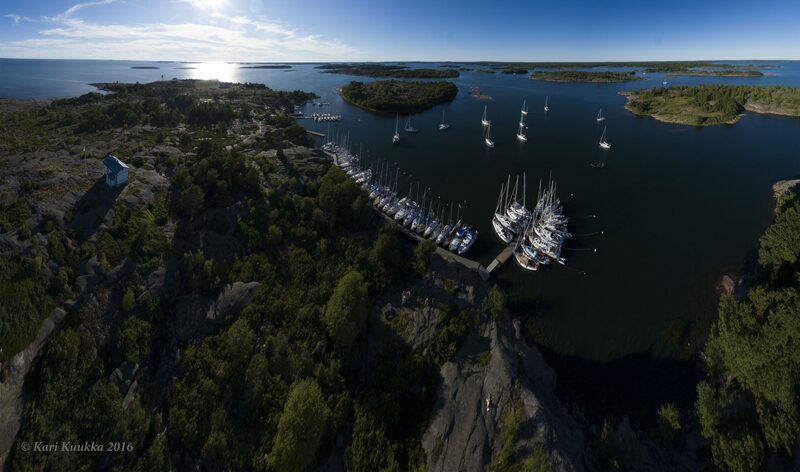 It would be totally legal to fly a chopper från Mariehamn and do the photo­graphy above. With at least 100 times or more of money, burning fuel — real eco friendly — and causing noise to the delight of the boat people below. In Sweden, my photo­graphy above would now be consi­dered surveil­lance. And it is catego­rically forbidden. A tiny anecdote to the image above: as a profes­sional — well, you try to act like it and take everybody into consi­de­ration. The people on the forground — swedes, by the way — I told them what I was doing. And anybody who really works with RPAS knows that you would not fly directly above the boats simply for security reasons. And simply out of courtesy, you keep your distance so you don’t piss people off. And the woman on the foreground reading definitely knows that I am shooting images (as she is my wife…). People in Finland are protected by a law which says your home is private (and any lawyer would extend that concept of privacy to a boat I am sure). I am sure Sweden has a similar one. Sweden, for some reason, seems to think that remotely operated helicopter poses an additional and direct extra threat to their privacy. And you need to catego­rically prevent it. I wonder who gets the punishment: the little happy and proud Mikael/Andreas/Björn… who got the new toy for Xmas — or the father who bought it? Seriously: how about all the documen­taries and adver­tising which have become almost dependent on aerial footage? Just randomly, I flipped open the TV last night and counted four different uses of RPAS imagery during just one hour of random screen time. I am sure Swedish documentary makers are really, really happy about this. Aerial footage is an essential part of modern visual story­telling… well, except in Sweden, it seems. And I am sure all the local tourist offices are clapping their hands in joy, as lots of the images they like to use for publicity just became very hard to make. In Sweden doing the image below would be consi­dered illegal — although my boat and the four of us on the pier are the only people within five mile radius. And we are on a public place. However — and now comes the interesting part: the images below are consi­dered legal. Why? Because they were not shot from a flying platform — drönare, as the Swedes court calls it — but with a monopod. Made of carbon, reaching to the height of ten meters. Now, just for the arguments sake: which one of the images poses more of a potential threat to some perceived/imagined issue of surveil­lance and privacy? Think about: somebody sees you went to a skiing compe­tetion — when you said you were going to a bar? Or maybe you can spot Terese Johaug waxing her lips somewhere in the images? How about the fact that I released the shutter on the monopod with a help of a radio trans­mitter? Does that constitute a case where “the camera is operated not on location” — which is the argument given by the swedish highest court defining surveil­lance? And, if that is the case: would the fact that if I’d used a wired trigger (instead of wireless) change the offence? Or is the use of a 10 meter carbon pole a problem? I mean, I am holding the camera high above my head, very typical vertical height to an aerial shot. Is the length of the pole an issue? If so, what is the accepted length and if the whole idea of using a pole be illegal in Sweden, how does the court think about selfies­ticks? And if the deciding judge has an issue with buzzing flying platforms… how about helium balls? They were used in the pre-RPAS times quite often. Although doing a controlled dollyshot can be a bit demanding. And think about major sports events. Use of remotely operated cameras to cover the action is so standard you don’t even think about it. As ridiculous as it seems, but I have to ask: does this decision mean that we will not see major sports events in Sweden? Because if you read the courts decision I refer to, it is enough that the camera is not operated in location to classify it as surveil­lance. The decision grants permission to have a camera mounted inside a car (and the press­re­lease makes a point explaining how the camera can be controlled when INSIDE the windscreen as opposed to OUTSIDE). Well, who is the lucky one to give Google the call and say their streetview is now consi­dered illegal in Sweden? Now, seriously. Aerial photo­graphy is a major business. This has tremendous consequences to photo­graphers, filmmakers, adver­tising, realestate, media, etc. — and amateurs/hobbyists as well — who finally have a great tool for showing — literally — a bit different perspective of their subject matter to the public. Businesses which bring I don’t know how many millions of euros taxable revenue to the table each year. The profes­sionals depend on these tools for their living. They also serve others. I mean think about it: media cannot use RPAS for coverage? But the law enforcement can? I find that extremely, extremely scary scenario. And I am not alone in this, here is commentary of the publisher of Aftonbladet, one of the leading papers in Sweden. She used the pc expression “overreaction”, the only word which came to my mind is “brainfart”, butI doubt she would disagree with me. What you can shoot and what you can publish is controlled by the existing law in Finland — and I have no reason to think Sweden, or any country for that matter, is different in this respect. You cannot argue (well in Sweden you can) that an image taken from a RPAS consti­tutes surveil­lance any more than an image taken with a cellphone on a stick over a fence. Maybe even contrary would be more accurate? I remember shooting Michael Jackson concert years and years ago. We were given orders that only focal lengths less than 200mm were allowed — obviously because he did not want his face seen too sharp and close. Too many scars from the plastic surgeries, or what ever. Simple enter­tainment, Michael Jackson, blaah…I really did not care. Then this morning on our national TV the police was talking about their new RPAS systems. Really good for them get proper tools and good for the public also IMHO. And a couple of months ago our military showed off their new RPAS-tools they have for boarder control. Again, good for them to get tools they can use to do their job better. But: media cannot use RPAS to cover news? Has somebody in the courtroom forgotten what the role of the media is in a democracy? The guys with guns can but the guys with pens and cameras can’t? I agree we need new legis­lation in changing circums­tances. In several fields. It should be well thought of, however. Prepared together with the all those concerned. In Finland we have currently very liberal legis­lation when it comes to RPAS and consequently, we have developed some amazing applica­tions for the use of it (in mining, powergrid inspection, thermal imagery, just to name a few.). Lots of people working in the field are contri­buting and working together with TRAFI (agency in charge of RPAS in Finland) to keep it so and to develop the field further. And perso­nally I am really happy about this. If you are wondering my motives for this outburst, it is just that the people in power over here quite often look to our nearest neighbour (no, not Russia…) for a model of best practices. This time they really should not — and frankly, I do not think they will. For my Swedish colleagues I hope some common sense enters into the actual application/use of this decision. There has to be another solution than this uninformed total “nej” we see now. Is it law already or a proposal at this stage? I would have thought Swedish photo­graphers are protesting pretty strongly against this. Surely it can’t go through. There might have to be some kind of restriction, so that commercial flight paths are safe, and permission for shooting over ‘sensitive’ places, such as schools and military instal­la­tions. But a blanket ban??? There are lots of cases in Finland when you need a special permission, but they are more excep­tions to the rule. And totally justified (military, goverment instal­la­tions, airports, etc. ), but Sweden went — as you said — a blanket ban. I saw some pretty shocked commentary in the web when the news came out. Time will tell what the practise will be. And did some further reading on the subject. Yes, you can apply for a permission… and it comes with a hefty pricetag.